Film and music have been like twins since the beginning of the film era. Shortly after the first "silent" movies were running in the penny arcades and nickelodeons there was music. The flickering screen drama was accompanied by piano player, who hit the keys. Today we have breathtaking soundtracks in film. Vangelis, Hans Zimmer and others are "hitting the keys" now in newer times and today. Here at the Cinema City we bring you the finest music and events!! 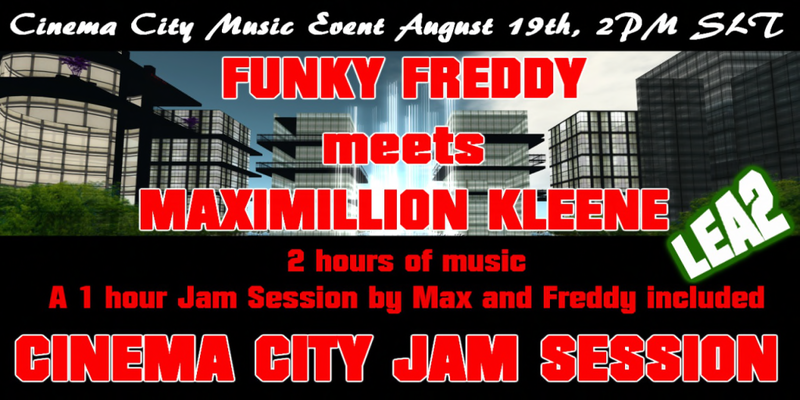 This time it's good old rock music with mind blowing guitar solos and experimental/improvising parts by the talented Funky Freddy and Maximillion Kleene singer/songwriter who shares his upbeat tempo styled music to "The City"! These two will have a dual stream Jam Session, together." Cinema City " will shine with your attendance at this powerful music JAM. Please join us , bring your friends the 19th at 2PM and enjoy the concert, do feel welcome to explore LEA2 "anytime" !